The Boundless WPA will absolutely enhance the flavor of the vapor produced from the Boundless CFV ('old' version only! ), CF, and CFX. 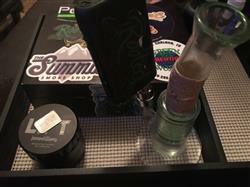 Aside from enhancing texture and flavor, the glass adapter also helps alleviate irritation by cooling down the vapor and making it feel smooth on your throat. There are some Boundless vaporizers that emit harsher and hotter vapor. This water pipe adapter will upgrade those units and make vaporization more fun for you. The Boundless CFV WPA is not exactly an essential appendage, but once you use this adapter with your glassware, you will notice that the WPA does make a difference. CFV owners, please note: This WPA is not compatible with the newer version of the Boundless CFV (that was released in September 2018). Please contact us if you are not sure about the version you have. bought my flowermate swiftpro from POTV and now bought my water adapter for it from POTV again as always I LOVE YOU GUYS I always refer friends to y’all Ps it’s been about a year and my swift pro is acting up battery wise is there a way I can exchange and get a new one? Take care!!!! Works like it should! Love it with my cfx. Great airflow and great taste. Huge clouds A+ product by boundless. Great Product and Lightning Fast Delivery! The Boundless Tera is easy to get up and running, and our guide will make sure you’re on track. The Boundless CFC Lite First Look - their smallest and least expensive vaporizer yet! We stopped by the Boundless office in LA to check in on the latest developments.